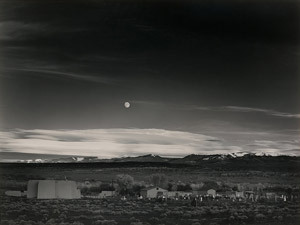 A rare, early print of Ansel Adams's Moonrise, Hernandez, New Mexico, sold at Sotheby's, New York, in October 2006 for $609,900, a world record for the photographer at auction. Now in its 26th year, The Photographic Art Market is the definitive authority for reported prices for photographs sold at auction annually. Each volume lists all photographs sold at the major photography auctions for the calendar year and provides complete information, including auction house, date of sale, lot number, print type and dimensions, negative date and print date, the estimate, and the amount paid. Each volume is $74.95 plus $5 shipping by priority mail in the US or $11 overseas airmail.